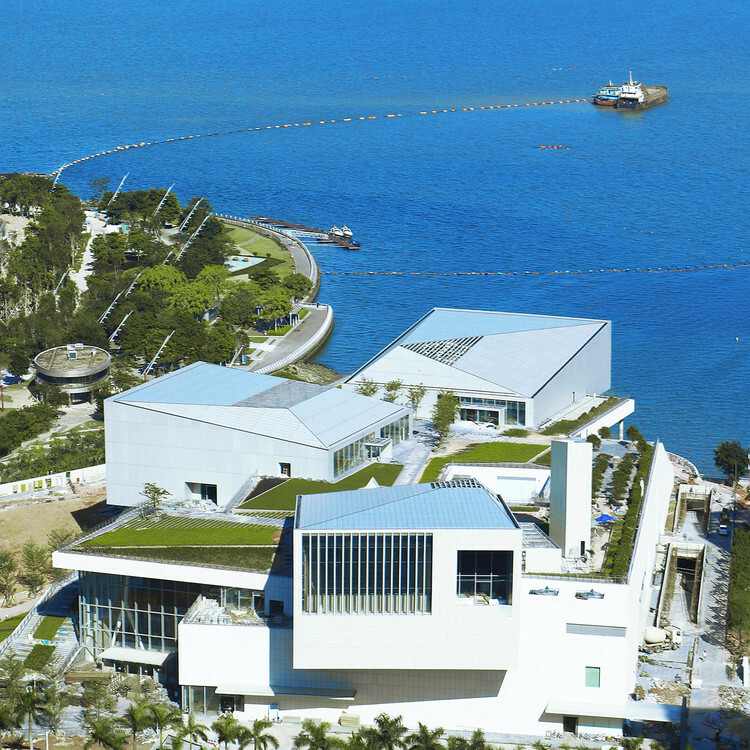 The Sea World Culture and Arts Center is the first building by Maki and Associates in China. Designed in 2011, every aspect of the building was crafted to reflect its function as a premiere public institution, as well as to make a connection between Sea World, Nüwa Coastal Park and the coastline. The building is located within Sea World’s coastal city complex in Shekou, Nanshan District, Shenzhen. The urban placement of the building is symbolized by three large volumes on the roof which face in three different directions, each representing a different local context: the sea, the mountains, and the city. 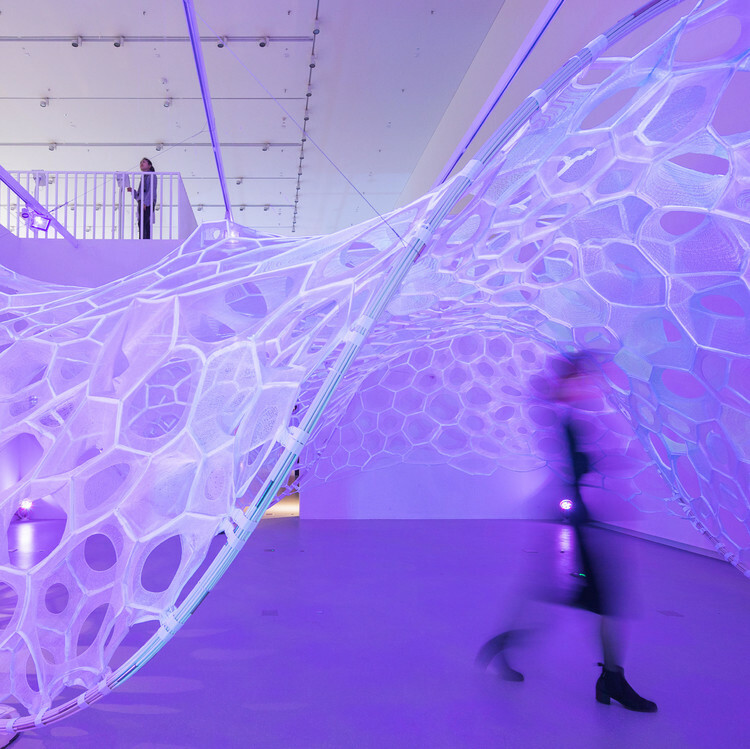 The result is a shape that symbolizes an opening up to different horizons and SWCAC’s mission to disseminate culture and information to Shenzhen and beyond. The fusion of the building’s cultural and commercial program may be observed in the three main plazas positioned along the main axis of the building. The Cultural Plaza, featuring red sandstone, gives access to the different galleries in the building. The Central Plaza, is situated in the middle of the building, with views of the third floor courtyard. The Waterfront Plaza is located at the southern entrance of the museum, facing the bay. 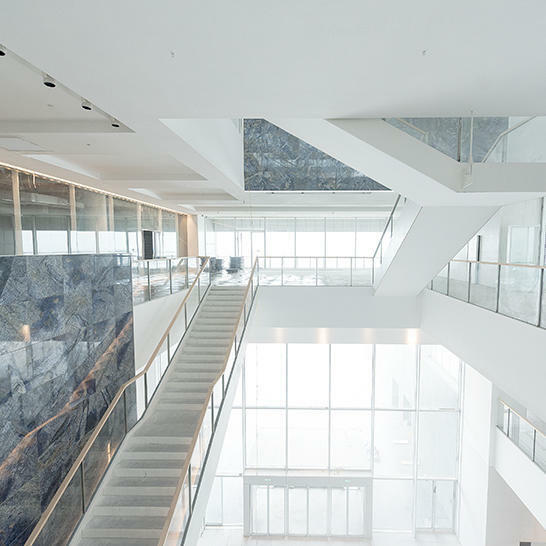 Blue granite detailing complements the views over the water outside. From these plazas, visitors can move freely between different floors. The building has also been designed to integrate with the surrounding park and waterfront, allowing visitors to walk around and explore freely. Two large staircases on each end give free access to the roof garden, inviting visitors to enjoy views over the ocean and surrounding landscape. You can walk in straight lines, or follow the many curves and stairs. You can walk through, or even over the building. The SWCAC is a place to wander, linger and discover. Design Society has two main galleries for largescale temporary exhibitions: the V&A Gallery and the Main Gallery. The ground floor also features the Park View Gallery with large windows to the park outside. All gallery spaces have been designed and fitted to the highest quality to accommodate many different exhibition possibilities. A minimal number of columns allows for maximum use of the exhibition space and free exhibition planning. The 3 volumes on the roof open to three directions: city, park, and sea. The result is a building form symbolizing SWCAC' s role to disseminate culture and information to Shenzhen andbeyond. A 328-seat auditorium marks the crown of the Culture Plaza. 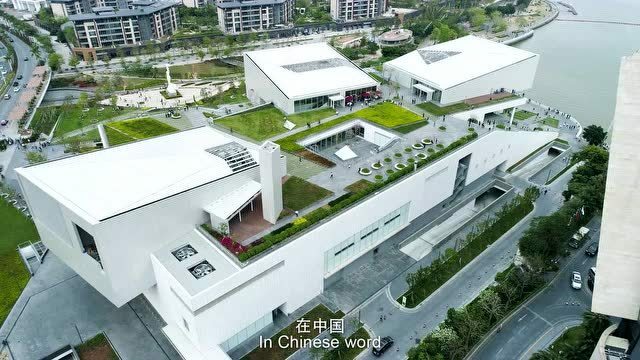 With views overlooking Nanshan mountain, a third-floor foyer opening up into a terrace, and a fourth-floor foyer overlooking the roof garden, the theatre will be a place to host lectures and performances. 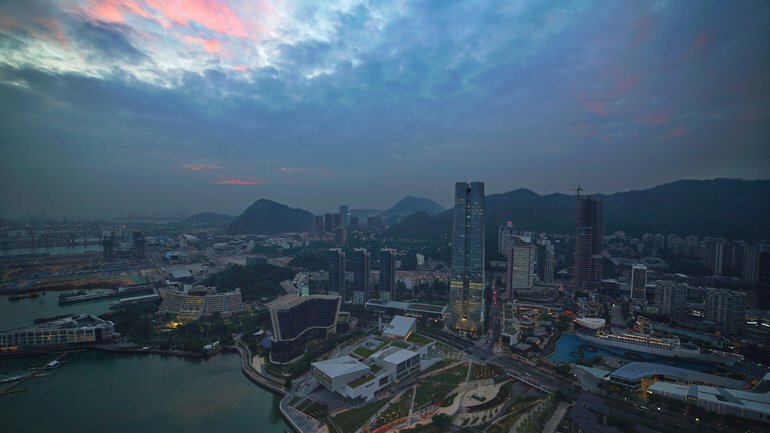 The Horizon Hall is a large 800-square-meter space with views over Shenzhen Bay and Hong Kong. Made for hosting presentations and events, it is equipped with screens, hanging points and lighting tracks for flexible use. The blue resin floor and a ceiling composed of curved wave-like structures refer to the sea visible through the wall-to-wall windows. The park around the building was also designed by Maki and Associates in collaboration with Studio on site. Tilted plateaus of different types of plants and grass are crossed by pathways extending towards the different urban axes. The park merges into the Nüwa coastal park, featuring the iconic Nüwa statue and the coastal boulevard. 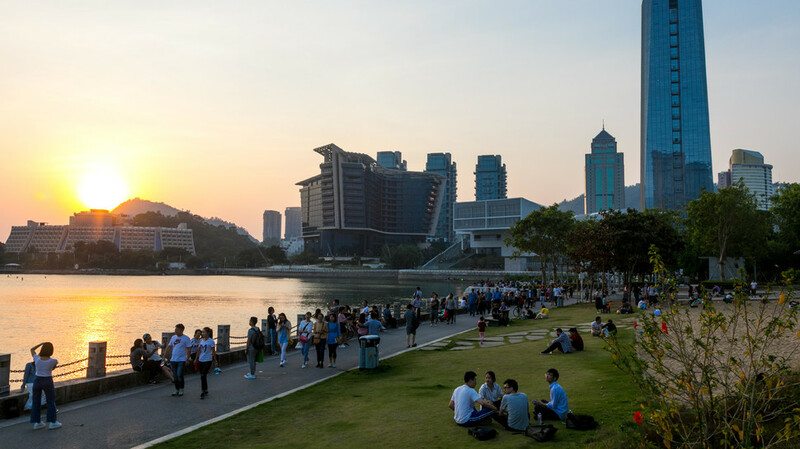 Fully opened in summer 2017, the boulevard connects the building with Shenzhen Bay Park, which follows the coastline of the bay. There are three main plazas, located along the main axis of the building. The Cultural Plaza located at the front entrance gives access to the different gallery spaces. The Central Plaza features shops and dining, and the Waterfront Plaza opens up to the bay. Each of the plazas present different opportunities to relax and interact. An elevated extension of the park below, the roof garden was developed as part of the whole landscaping plan. It can be freely accessed from the main exterior stairs leading up the front and back of the building or from the inside. 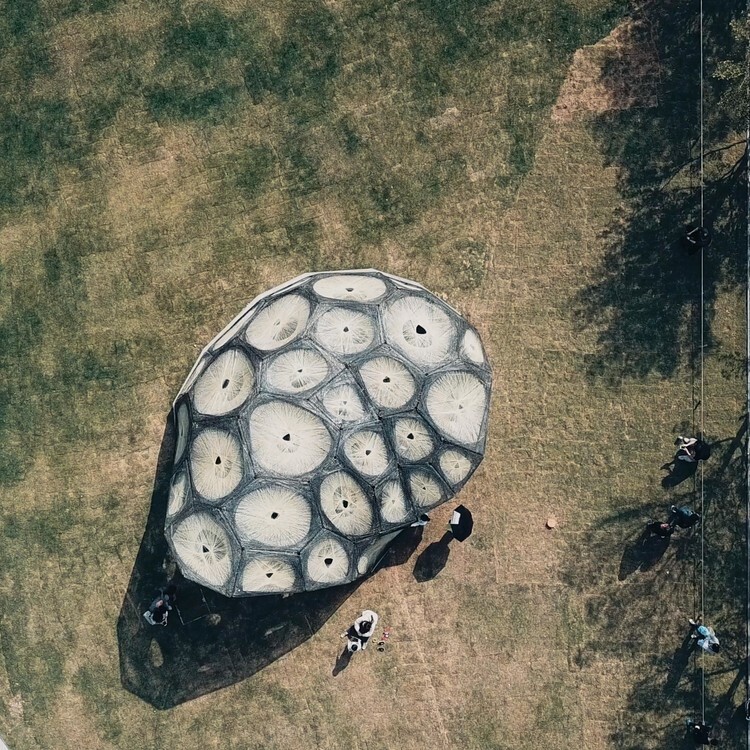 The rooftop presents different types of vegetation, grassy spaces and trees, and views over the surrounding mountain, bay and park. Located on the ground floor in the Cultural Plaza, the museum shop provides creative consumer experiences and a place to connect with international and local design brands, as well as exhibition- and program-related content. The building features an educational space on the second floor, which hosts activities for families, and children of all ages. The building has two workspaces for artists- and designers-in-residence. Located on the second floor opposite the educational spaces, these workspaces give audiences a chance to come face-to-face with creative practices. 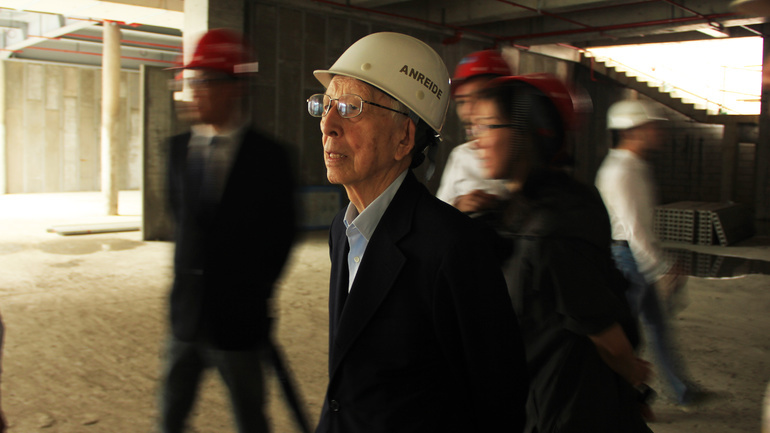 Fumihiko Maki is a prolific and celebrated architect with a diverse body of work. Born in Tokyo in 1928, he completed his education in both Japan and the United States. 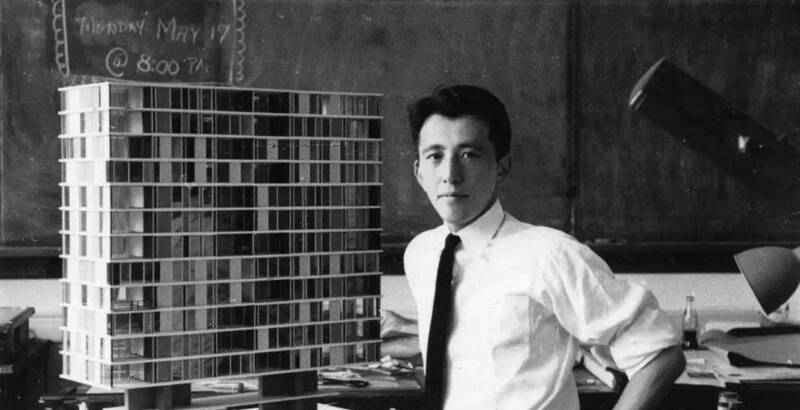 He studied and taught at the University of Tokyo and the Harvard Graduate School of Design before returning to Japan in 1965 to found Maki and Associates, an international architecture firm based in Tokyo. With a career spanning more than 50 years, Maki’s practice continues to create buildings that remain relevant to the needs of their time. Each of his projects builds upon the local context, and are made with careful consideration for their future users. Maki and Associates have realised many large-scale projects throughout the world, including museums, culture and art centers, university buildings and large office developments. Some of their recent works include 4 World Trade Center in New York, Singapore Mediacorp and Tokyo Denki University. Maki has been an avid contributor to architectural thinking throughout his career, promoting his views on architecture and society through teaching, lectures and publications. He has been recognized by some of the profession’s highest honors, including the Union of International Architets Gold Medal, the Wolf Prize, the Prince of Wales Prize in Urban Design and the AIA Gold Medal. Foremost among Maki’s many distinctions is the Pritzker Prize - often regarded as the ‘Nobel Prize for ‘Architecture’, awarded to Maki in 1993. 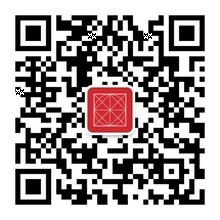 “In September of 2011, I received a call asking us if we were interested in doing a project in Shenzhen. The program location and the client of the project, drew my interest. Later that year, we visited CMSK and the site.